Got a question for Five Finger Death Punch? Tell us and win some D'Addario strings! 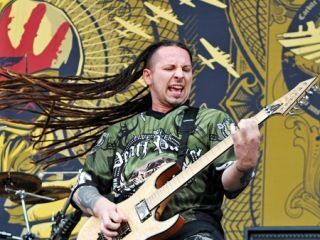 TG is interviewing Five Finger Death Punch guitarist and founder Zoltan Bathory next week and we're giving you the chance to ask him your questions. If you've got something you want to ask one of the biggest bands in modern American metal right now, just get in touch via the Total Guitar Twitter or Facebook pages or by emailing totalguitar@futurenet.com with the subject line 'Question for Five Finger Death Punch' and your name, location and question. The metallers are currently riding high in the US chart with their new third album American Capitalist so maybe you have a question about Zoltan's writing and recording for it. Or maybe you'd like his tips on learning a specific FFDP song, or even what his current rig on tour is. Finally, remember we're a guitar mag, so although we may slip in a few general ones, if you ask a question about Zoltan's guitar playing or songwriting, you're much more likely to get it answered. If we pick your question, you'll win a set of D'Adarrio guitar strings and feature in TG224 (on sale 5 January).